I started making kombucha in August of 2013 (and side note to that post: A 10pm run to Walgreens for sugar? Oh man, I miss those days of randomly running out to the store at weird hours. That *does not* happen now with a toddler. Making kombucha at 10pm also does not happen!) and I’ve kept it up on and off in the years since. Brewing and drinking kombucha is definitely cyclical, with months of being very interested in having the drink around and other months where the batch sits in the closet just hanging out until I’m in the mood for a new batch. For those months that the brew just hangs out, the batch becomes very fermented and basically turns into a vinegar. Some people will take this vinegar and turn it into salad dressings but others will turn it into a shrub. 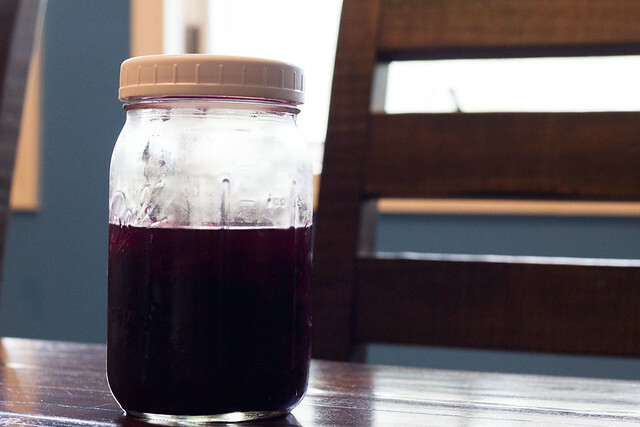 Shrubs are typically made with drinking vinegar, like a high quality apple cider vinegar, but there are now recipes and variations for kombucha shrubs. Google will get you several recipes to get ideas but I gleaned my idea from the Cultures of Health blog. Since we’re still flush with fresh blackberries from the garden I took a generous handful of blackberries and put them in a bowl with about a 1/2 c of sugar, smooshing it all together with a fork and then let it sit for 5-10 minutes. I then put that mixture into a quart Ball jar and filled the jar with my overfermented kombucha, put a cap on it and then put it in the fridge for about four days. On the way home from work I picked up a bottle of club soda and tested out my drink one evening before dinner. I used a fancy wine glass for effect and mood, pouring about a 1/4-1/2 c of the shrub in the glass with another 1/2 c of club soda. I was very pleased with the results: a slight tangy flavor with just the right amount of sweet for a great refreshing summer drink. You could switch out the club soda for rum or maybe vodka if you want to go with some alcohol; I’m even thinking the right white wine might even be good for this mixture. 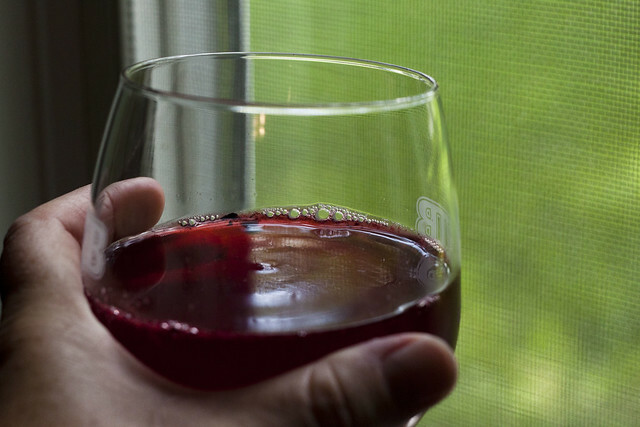 If you want to try a more traditional vinegar shrub you should check out Lisa’s rhubarb syrup shrub recipe she just posted!